It’s 9 November 1938. Broken glass is covering the streets of Europe. But it’s not about the broken glass. This is the beginning of the largest genocide in human history. It’s 9 November 2015. Hate crime is on the rise all over Europe. Right-wing extremists set fire to asylum detention centres. Refugees that manage to survive the dangerous journey to Europe are forced to travel across the continent by foot, denied assistance from EU states. Right wing populist parties are making gains in European, national and local elections. Anti-migrant rhetoric fills the mainstream media. Didn’t we say “Never Again”? From 1933 to 1945, millions were exterminated by the Nazi regime simply for their religion, ethnicity, sexual orientation, perceived disabilities or political views. Overall around 11 million people, most of them Jewish, were murdered in atrocities by the Nazi state. This genocide became known as The Holocaust. Systematic violence against Jewish people began with the “Kristallnacht” pogrom on 9th November 1938, when Jewish homes, shops and places of worship were attacked across Nazi-occupied territories. The name “Kristallnacht” means “Night of the Broken Glass”. But it’s not about the broken glass: by the end of the Second World War, antisemitic violence had resulted in the deaths of around 6 million Jews. After 1945, the people of Europe were united by a common message: Never Again. But today, that common message has never seemed further away. The current refugee crisis has been a polarising force: on one hand, it has inspired many in Europe to stand in solidarity by providing support to desperate asylum seekers and refugees, while on the other hand, far-right groups have launched violent attacks on refugees and their homes, mainstream media has chosen to dehumanise refugees and migrants, and many politicians have increased their use of divisive anti-migrant rhetoric in their pursuit of right-leaning votes; warnings that “swarms” of refugees will overrun our countries, accusations of terrorist sympathies and violent temperaments, suggestions that migrants harbour infectious diseases and parasites: all are an eerie echo of the fascist rhetoric of the 1930’s. 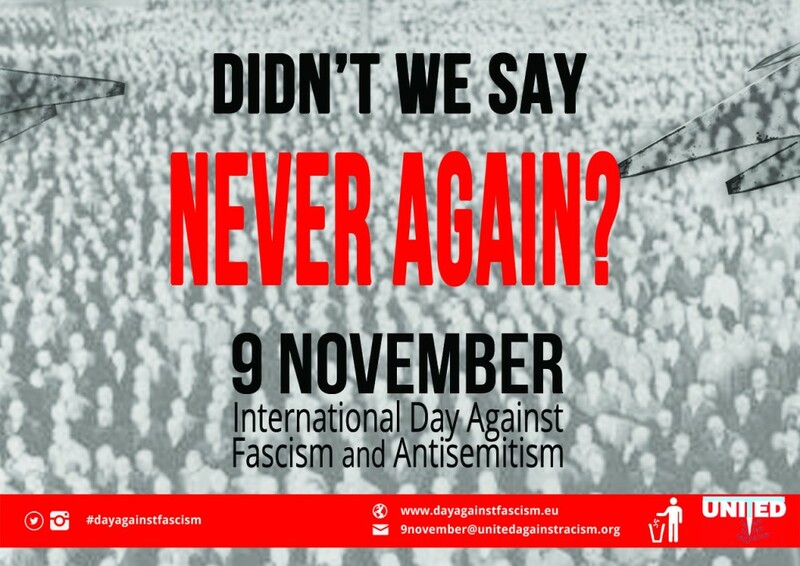 Every year around 9 November, the UNITED network coordinates the International Day Against Fascism and Antisemitism, and calls upon the international community to bring an end to hate. We ask NGOs, community organisations, schools, local municipalities – and you – to join forces and confront hate with direct action. 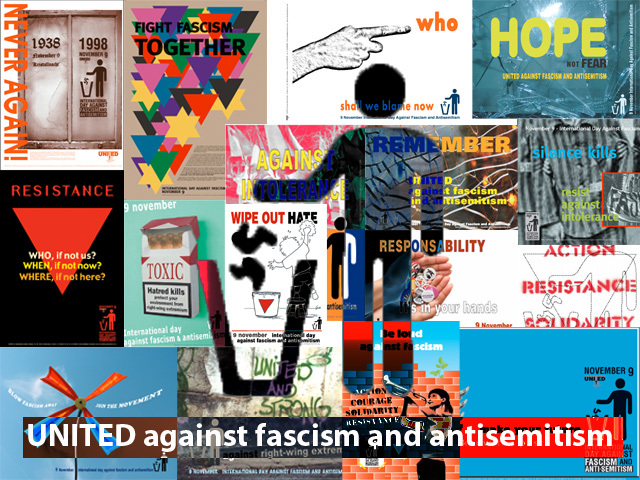 Organise activities, involve your city government, like the Facebook page, check the website, support others, spread the message and JOIN the 9 November campaign to UNITE against fascism and antisemitism. Order free campaign material and inform us about planned actions. 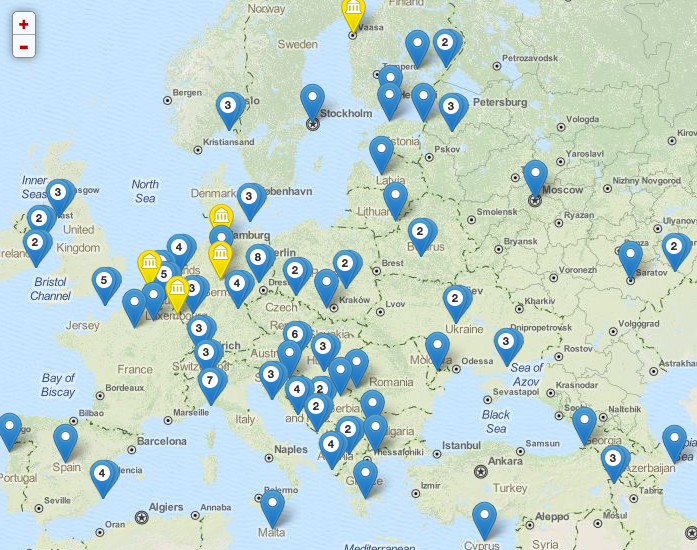 Your activities will be published in the online map of activities, which creates visibility and attention all over Europe. In this way you also contribute to the creation of a strong and diverse European-wide message against fascism, antisemitism and hate.